A very warm welcome to the ExpatCapeTown Newsletter in August 2009. Let me start with some great news. 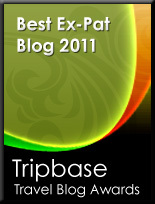 My ExpatCapeTown Blog was named by tripbase as one of the Top Ten expat blogs on the web. What wonderful news! It makes me really proud. Thank you so much for your interest in my Cape Town Insider Tips and support of my website too. And please go on and spread the word and forward this newsletter to your family and friends. Cape Town is a wonderful city and we really enjoy living in this part of the world,so I will continue to offer you many more insights to life in the Mother City. This newsletter shall give you some more special information on topics which will interest both the tourists coming to Cape Town for a shorter period of time and expats moving to South Africa or living in the Mother City or if you simply want to stay in touch and see what’s going on in Cape Town. • Insurance: Take out a comprehensive insurance, as car insurance still is not compulsory when driving in South Africa. Remember to take your insurance documents from overseas with you when you want to apply for a discount when taking out car insurance when buying a car in Cape Town. And get comprehensive insurance when renting a car too. • Street Maps: If you can get a navigation system, it will be really useful here. You can rent them with your car rental. Otherwise buy a good street map at bookshops or petrol stations not to get lost in areas which you better should avoid. • Driver’s License: Get an International Driver’s License if your driver’s license is not in English. You will need it when renting a car in South Africa. If you live here you can also get a certified translation of your driver’s license from your consulate in Cape Town and then you will have to carry the translation with your license when driving. • Driving Rules: For some special South African Driving Tips and Rules see my special page with more info about Driving in South Africa. • Buying a car: There are many big car dealers in Paarden Island and on Voortrecker Road. Check out their car deals and take your time comparing the cars on offer. • Renting a car: You can find car rental offices at the airport as well as in the city centre and in the suburbs. Always compare deals as they can vary widely and check out if you get a different rate if you are a (even if only temporary) resident of Cape Town. Always check the condition of the tyres, even with reputable companies and ask for a spare tyre. The acclaimed South African dance production "Cotton Club Moves" by Cape Town's own InSPIRAtions Dance Group will be coming again to the Mother City. The show celebrates the music of the 20s, 30s and 40s with popular music by Duke Ellington, George Gershwin and others of the Cotton Club era. So make sure you get your tickets for this great event. More about Cotton Club Moves. What else is on in Cape Town in August? August is also a good time to get some more of the great winter specials like on the Robben Island Ferries or the cableway up Table Mountain, which is closed until mid of this month and then reopens on the 17th with its birthday special deals, which is free return tickets for everyone having their birthday between the July, 20 and August, 16 for the first week after re-opening. So go ahead and celebrate again. And some of the best city restaurants still have their winter specials on offer like at the award winning "Savoy Cabbage" Restaurant in 101 Hout Street which celebrates its 11th birthday this August with daily specials. Congratulations! More great events and shows in August. 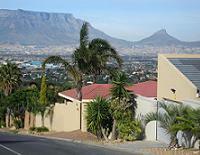 In this section you will find every month insiders tips and advice about the many suburbs of Cape Town. So you know where to stay and where to go. Why Hout Bay? This suburb lies roughly 20km to the South of Cape Town and borders the Atlantic Ocean. It is a popular suburb for tourists and expats as the travel to Cape Town City Center is short enough and along the scenic Atlantic Seabord. The area has got a relaxed atmosphere and excellent boutique shopping and amenities. The cove like Hout Bay beach, the busy harbour and the Sunday flea market are drawing lots of Capetonians to the suburb especially on the weekends. There is great housing to be found for any taste and pocket and there are some good private schools in the vicinity. Where to stay? There are many bed and breakfasts as well as great hotel and self-catering options in Hout Bay. There is splendid hotel accommodation close to the beach as well as high up in the Valley or at Suikerbossie. Where to go? Go walking or surfing on Hout Bay Beach. More info on Hout Bay Beach. High up on the mountain at Suikerbossie, you have got splendid views across Hout Bay and the Cape Peninsula. And definitely have some delicious seafood dinner at the Hout Bay Harbour. Where to find exceptionally good High Tea in Hout Bay? Head to "Kitima" in Hout Bay. This fine restaurant with its Sunday buffet of delicious local and Asian dishes is located in the wonderful old Cape Dutch Mansion, Kronendal Manor in Hout Bay’s Main Street. What about Chapman’s Peak Drive? Unfortunately the popular scenic drive which connects Hout Bay with Noordhoek is still closed to traffic, but you can walk up to the first look-out and still will have wonderful views over the Hout Bay beach and harbour. The scenic drive is said to reopen ahead of the start of the next tourist season at the beginning of September. More info on the scenic route. Why is the village called "Republic of Hout Bay"? In 1987 the people of Hout Bay pronounced the former fisherman’s village a republic and in 2007 opened a consulate which also today issues the popular passports to raise funds for the community. What is a granadilla? South Africans use this Spanish name for the passion fruit (passiflora) or maracuja. It grows to roughly tennis ball size here in South Africa and has a purple-brownish color. In Cape Town you can get the tasty fruit either from grocery stores or in bulk packs from "Fruit and Veg City". You can also sow seeds and grow granadillas in your Cape Town garden. To eat the fruit you just halve the fruit horizontally. The more firm the skin the more juice your fruit will have, but the shriveled fruits you often see in the stores are tasty too, as then the flesh is more compact but usually sweeter too. Most people like to crunch the little seeds, but you can sieve out the seed. Try them on cakes and desserts or eat them raw for a great vitamin packed snack. What is a bakkie? This is South African term for a pick-up truck, utility truck or light delivery truck. The cabin is usually small and for up to three passengers, while the back hold is open for easy loading and transport. Where to get delicious fresh goats cheese? Take a trip out to Fairview Wine Estate near Paarl for a lovely day out combined with shopping for good wine, cheese and freshly baked bread. Here you will find delicious cheese made with cows milk and goats cheese. If you are unsure what to take, go for a cheese tasting or even better go for a light lunch in the Goatshed Restaurant and order a cheese platter. This is real value for money and oooh so yummy! Where to get great wooden crafts and gifts? Drive along Victoria Road from Camps Bay to Hout Bay. There are several parking bays where you can buy local arts and crafts or handiwork imported from the neighboring African countries. What to do on a rainy day in winter? If you do not want to spend the rare rainy day in Cape Town at home reading, then head out to one of the many movie theatres which are mainly located in the big shopping centres across Cape Town. The cost for a movie is really low here, starting with ticket prices at R15.